Collaborating with the mainland would boost Hong Kong's advantages in scientific research and further integrate the special administrative region into the country's innovation and technology development, advises the city's leading neuroscientist. 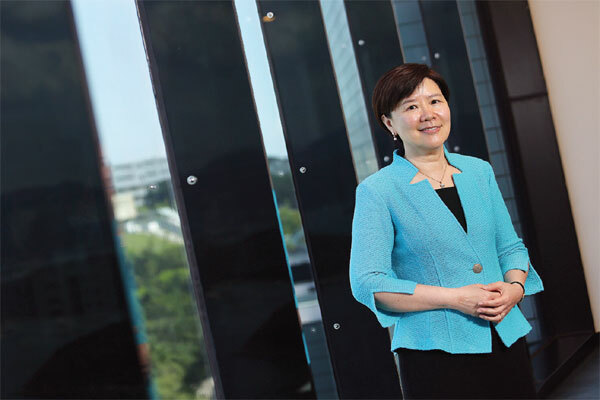 Nancy Ip Yuk-yu, a Hong Kong academician of the Chinese Academy of Sciences, hoped that closer collaboration with mainland scientists could give Hong Kong the chance to take a leading role in some national scientific research projects, rather than simply participate in them. If Hong Kong scientists lead national projects utilizing their international ties and advantages in certain scientific fields, the SAR will become a more attractive destination for related talents, Ip explained, noting that talent is the most important factor in science and technology development. Her remarks came after President Xi Jinping made an important instruction, calling for greater cooperation in science and technology between the Hong Kong SAR and the mainland. The instruction was in response to a letter to Xi from 24 Hong Kong-based academicians at the CAS and the Chinese Academy of Engineering last June. The writers appealed for national research funds to be used in the SAR, and for favorable policies on exporting scientific research equipment to the mainland. Ip was one of the 24 academicians and also the vice-president for research and graduate studies at the Hong Kong University of Science and Technology. She was delighted and grateful to see the central government's prompt response to their appeal and firm support for the SAR's scientific development. Complementary development through collaboration plays a vital part in scientific research. This is why the mainland and the SAR should strive for more exchanges and cooperation, she added. Ip said the Ministry of Science and Technology has successively allocated 1 million yuan ($157,400) in national scientific research funds to each of the 16 Partner State Key Laboratories and six branches of the Chinese National Engineering Research Center in Hong Kong - amounting to 22 million yuan in total - after the letter was sent. 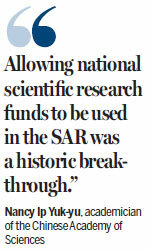 Allowing national scientific research funds to be used in the SAR was a "historic breakthrough" for scientists in Hong Kong and was an "important first step" to integrate SAR scientists into national development in innovation and technology, Ip said. She also hoped the funds could be allocated to other scientists in Hong Kong outside the 22 institutions in the near future. Ip also hopes more scientific resources on the mainland could be shared with the SAR under special national policies. These include patient samples and access to specialist machinery that Hong Kong lacks. The neuroscientist called for related industries to be more involved in scientific research to help industrialize research findings. Ip noted that forging the Guangdong-Hong Kong-Macao Greater Bay Area into an international innovation and technology hub was the core of this national strategy. She hoped the development of the Bay Area could further improve cooperation between Hong Kong and the mainland. This could help make full use of talents and funds on scientific research from both sides and take scientific development to a higher level, Ip said.